Dentistry is our profession but children are our focus because every child deserves a healthy smile. At Stoma, we strive to ensure that your child receives outstanding oral care in a fun, relaxed and professional environment. Pediatricians at Stoma are trained to meet your child’s unique oral health care needs from 6 months to 18 years. We use the most advanced techniques on modern state-of-the-art equipment to stay abreast of the development of dentistry for children. By starting your child’s preventive oral health habits early you are giving your child a future free from oral disease. We focus on prevention, early detection and treatment and stay current with the latest advances in dentistry for children. Step in and experience the excellent and compassionate dental care provided in a clean, friendly and welcoming environment. We believe it is necessary to take time with each child to understand their specific needs and concerns. Our staff will help your family learn preventative dental routines (brushing, flossing and cleaning) which can equip them with skills to prepare them for a lifetime of good oral hygiene to ensure your family's little smiles grow into big beautiful smiles. Stoma has Pediatric Dentists (differ from general dentist). A pediatric dentist has two to three years of specialty education after dental school and focuses his/her career on the treatment of children’s dental needs. Their area of expertise lies in being the main provider for babies, toddlers, children and teens together with those with unique health requirements. Pediatric Dentistry focuses around the distinct needs of your child’s oral hygiene and well-being. 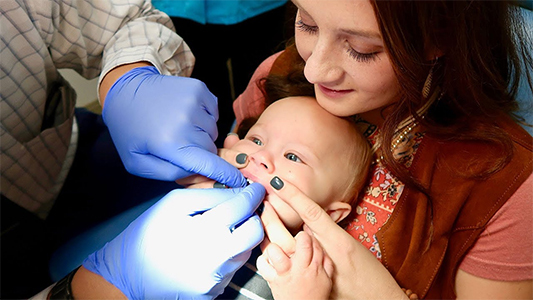 Upon completion of a four-year dental education, Pediatric Dentists continue on to an extra two to three years of intense training necessary to finalize their degrees in pediatric dentistry. This focused curriculum builds a foundation of knowledge, practical skills and hands-on care. By starting scheduled visits to the dentist at a young age, you set your child up for a lifetime of healthy dental behaviors. Your first visit to Stoma should leave a lasting positive impression for both you and your child. You should plan to schedule your first appointment upon the eruption of the first tooth or no later than your child's first birthday. Details on pacifier, finger, and thumb routines and how these affect your child. Professional examinations at regular four to six-month recall appointments are necessary. Developing problems can be found at an early stage and repaired easily, while waiting for a longer time may require redoing entire restorations. We will contact you when it is time for your recall appointment. Our practice is focused on preventive dentistry and, therefore, we tailor our oral hygiene instructions for each child and family to accommodate their unique situations.It also requires participation from you and your child at home by brushing, flossing, and a healthy diet. Child and parent education is at the heart of preventing dental problems and maintaining a healthy mouth. Early dental visits, starting at the age of 1 year, are part of the key to a successful preventive programme. Our skilled team will provide you with a personalized approach to caring for your child's teeth and gums and will include instructions on oral hygiene, dietary counseling, and a fluoride regime. An examination is a review of medical and dental history, which indicates whether there is need for specialized dental care. This entails a thorough head and neck exam where we check and chart the status of your child’s gums, teeth, soft tissue, and check for decay. We evaluate oral hygiene (effectiveness of brushing and flossing), oral habits (pacifier use, thumb sucking, etc.) and diet (juice intake, stickiness of snacks, etc.). Prophylaxis is the removal of plaque (bacterial food remnants) and calculus (plaque that has hardened to become tarter) using either a manual toothbrush or motorized toothbrush (depending on child’s needs). Calculus requires removal with special dental instruments in addition to the toothbrush. Dental sealants are an important part of Preventive Dentistry. A sealant is a protective resin coating that is applied to the chewing surfaces (into the grooves) of the back teeth (permanent premolars and molars). Sealants are normally easy to place in one visit and do not require local anesthesia. Any tooth that is susceptible to cavities, including primary (i.e., baby) teeth, is a candidate for sealant application, including newly-erupted permanent bicuspids and molars. The dental sealant is the most economical preventive restoration which needs only one visit. Sealants can be effective for many years, but only provides protection when it is fully intact, so it must be evaluated at each 6 month cleaning for any need for touch ups. If your child has good oral hygiene and avoids biting hard objects, sealants will last even longer. These are sometimes known as “cavity detecting” x-rays. Bitewing radiographs, are a set of two or four x- rays (depending on the age of the patient and the teeth present) that allow us to view in between the teeth (where flossing is beneficial and where we cannot see visually). These radiographs help us assess the health of bone, teeth, and to diagnose cavities. This is an x ray taken to assess a particular tooth. Periapical radiographs enable the assessment of the root, nerve, and bone. Sometimes these radiographs are taken in place of bitewings to help diagnose cavities, when bitewings are not available or obtainable. A panoramic radiograph is an x ray that “goes around the head” and provides a general overview of your child’s mouth and jaws. It is initially taken around 6 years of age (when the 6 year molars are erupting) and then repeated every 3-5 years thereafter as a diagnostic tool. This radiograph is taken to evaluate tooth and jaw development, as well as to catch any anomalies early (missing permanent teeth, extra teeth, abnormal growth areas, etc.). A panoramic may also be taken if a child suffers trauma to their jaw. Despite our best efforts in prevention, cavities do occur. Restorative dentistry is any dental procedure that fixes problems caused by decay and dental disease, such as routine fillings, crowns and cosmetic bonding to repair broken teeth. Composite is a white filling material that provides an esthetic dental restoration. It can be used for small to average-sized cavities. Placement of white fillings is very technique sensitive and requires a high level of child cooperation. Advances in dental science have allowed composite fillings to approach the strength and durability of conventional silver fillings. A tooth has received a nerve treatment. The SSC is an economical, time-efficient, mercury-free dental restoration that has a 60-year track record for durability and safety! If a child has anterior (front) tooth decay, a resin crown may be the treatment of choice. The resin crown is an all white crown that can be the most esthetic type of restoration for primary teeth and is used when decay is not extensive and the gums are healthy. A child with severe decay on his or her front teeth may require this type of esthetic crown. A stainless steel crown is coated with an attractive resin material and the crown is placed over the tooth after the decay is removed. This is a great restorative option to maintain teeth that may otherwise require extraction. Pulpotomies and pulpectomies may be used to save severely decayed or broken teeth from extraction. Primary (i.e., baby) teeth can be preserved to help guide the permanent teeth into proper placement as well as provide your child with increased dental function and esthetics. Pediatric dentists specialize in treating traumatic dental injuries in children of all ages. We also specialize in the treatment of dental infections resulting from broken teeth or large cavities that may cause dental abscesses. In the event of trauma of any type, notify our clinic immediately. Many dental injuries and severe infections are time sensitive and require treatment that must not be delayed. Below are some tips on dealing with urgent dental situations. We suggest displaying this list on your refrigerator or storing it near your emergency phone numbers for easy reference. If your child has bitten their lip or tongue severely enough to cause bleeding, clean the bite gently with water and use a cold compress (a cold, wet towel or washcloth pressed firmly against the area) to reduce or avoid swelling. Give us a call to help determine the seriousness of the bite. If your child has chipped or broken off a piece of their tooth, have them rinse their mouth with warm water, then use a cold compress to reduce swelling. Try to locate and save the tooth fragment that broke off and place it in a clean container of milk, and call us immediately. If your child's permanent tooth has been knocked out of their mouth, find the tooth and rinse it gently with cool water (do not scrub it clean or use soap), taking care to only touch the crown of the tooth (the part you can see when it is in place). If you can, place the tooth back in its socket and hold it in place with a clean towel or cloth. If you cannot return the tooth to its socket, place it in a clean container with milk, saliva or water. In either case, call us immediately and/or head to the hospital. If you act quickly, it is possible to save a permanent tooth. Rinse out your child's mouth and check for any other tooth damage. Place pressure with gauze or a washcloth, this will help control the bleeding. We do not put baby teeth back in their sockets after being knocked out because it is very unlikely the teeth will heal properly. There is a risk that the tooth will fuse to the bone and inhibit proper eruption of the permanent tooth that follows. In the event a baby tooth is knocked out, call our clinic to schedule an appointment to make sure no other teeth have been damaged and that proper healing is occurring. If your child complains of a toothache, rinse their mouth with warm water and inspect their teeth to be sure there is nothing caught between them. If pain continues, use a cold compress to ease the pain. Do not apply heat or any kind of aspirin or topical pain reliever directly to the affected area, as this can cause damage to the gums. If you know or suspect your child has sustained a severe blow to the head or a broken jaw, use a cold compress to reduce swelling. Go directly to the emergency room of your local hospital immediately, and call our emergency number. In many cases a broken jaw is the result of a blow to the head. Severe blows to the head can be dangerous and even life threatening. Interceptive orthodontics is the process of identifying malocclusions (crowded or crooked teeth or bite problems). It aims to correct any skeletal and dental discrepancy or habits during the developmental stage of a child to ensure that the child develops a full set of dental arches with straight teeth and a good bite. Orthodontic problems are caused by habits such as thumb sucking, fingernail biting or lip biting. The biggest point of Interceptive Orthodontics is to get the child's teeth straightened before it becomes a problem for their adult life. Early preventative treatment is recommended so that when the permanent teeth are in that the teeth and jaws are in alignment. Waiting until all the permanent teeth have come in, or until facial growth is nearly complete, may make correction of some problems more difficult. For these reasons, it is strongly recommended that all children get an orthodontic check-up with an orthodontist no later than age 7. While your child's teeth may appear aligned and straight to you, there could be a problem that only an orthodontist can detect. There are several forms of Interceptive Orthodontics used to control placement and growth of the teeth. Braces use metal connectors attached to the teeth to gradually create a straighter alignment. Braces are the most prominent orthodontic treatment, but they’re far from the only one. They are used as a last resort when other methods do not work out. When one of a child’s baby teeth falls out, it leaves a space that may not be filled for some time. A space maintainer will hold the empty space open until the permanent tooth takes its natural position in the child's mouth. In some cases, crowding elsewhere in the jaw may cause that space to be filled by teeth that do not belong there. If you see this happening in your child, see your orthodontist about space maintainer to keep the other teeth from moving into that space. Space maintainers prevent the need for future costly orthodontic treatment. Thumb and finger sucking are among the top causes for orthodontic problems in young children. These habits can lead to misaligned bites as well as abnormal spacing between the top and bottom teeth. If you can’t seek to get your child to stop sucking his or her thumb or fingers, your orthodontist Calgary may be able to install a temporary in-mouth appliance that will help break this habit. For mild misalignments of the jaw, retainers may be used to apply gentle pressure to the teeth when the individual is sleeping. They are also used following a braces treatment to help make sure the teeth stay where they should be. Like braces, a dental headgear uses the child’s natural growth to help force the jaw into a different alignment. The headgear attaches to the face and jaw and has an attached implement that goes into the mouth. These elements work together to force the jaw to stay in position. Most are designed to be worn only when the child is sleeping. When the back upper teeth fit inside of the lower ones, this is known as a cross-bite. This misalignment can be repaired by using an appliance designed to expand the upper arch of the jaw, which will spread the upper teeth and create a more normal alignment. Behavior guidance techniques are used to promote a positive dental attitude, safety, and quality dental care. Through communication, the dental team at Stoma can assist your child with fear and anxiety, teach coping mechanisms, and guide your child to be cooperative, relaxed, and self- confident in the dental setting. Completion of the procedure (“Do”). Rewarding desired behavior with praise, stickers or prizes, and toys. Diverting your child’s attention away from the actual dental procedure by using video games, movies, and television programs. With basic behavior guidance techniques, we use local anesthesia, a numbing agent to “make the teeth sleepy”. Often this is all that is required for cooperative children. Children who are unable to cooperate due to lack of emotional maturity or mental, physical, or medical disability. Children for whom sedation or general anesthesia may protect the developing psyche and/or reduce medical risk. Uses laughing gas (nitrous oxide/oxygen) to achieve mild sedation. This gas is most successful for the understanding child who is anxious about dental care. Laughing gas is a very safe drug that has an onset time of about 5 minutes and loses its effect in about the same amount of time when your child returns to breathing room air. Uses nitrous oxide plus a short-acting drug (i.e. Versed) that produces additional sedation and memory loss (in about 75% of children) for the duration of the dental treatment. The drug is given by mouth approximately 15 minutes before dental work begins. This technique is used for short procedures (less than 30 minutes). A recent, normal physical examination from your family physician or pediatrician is usually required. Most of the time, your child will not be asleep during the above sedations. Children less than 25 pounds are not good candidates for sedation. Also, there is no drug (or combination of drugs) that works well for all children. Pediatric patients vary significantly in their metabolic rates and in their response to drug therapy. Sedation works successfully in about half of children. Children who live long distances from our clinic and have extensive treatment needs that would require multiple sedation appointments. General anesthesia is the use of anesthetic gases and drugs that "put the child to sleep." They are administered only by an anesthesiologist or nurse anesthetist. Your child is unaware of dental treatment while under the influence of a general anesthetic.